Wearing an elegant bow tie is an effective way to make you look charming and energetic. The tie/bow tie is often the centerpiece of the dress, it's important to choose your tie/bow tie wisely. 2. This kind of bow tie would be perfect for any formal or casual occasion. It would make a perfect gift and a excellent addition to any man's wardrobe. It is a self-tied bow tie (you have to tie it yourself). We focus on tie many years, Self-tied bow tie can make you look attractive and individuality which pre-tied bow tie is lack of. The natural form is charming and vivid when you tie it up. 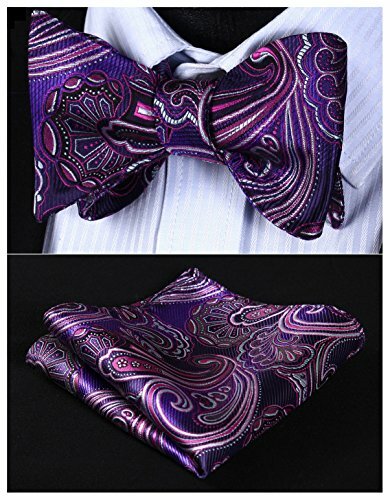 This bow tie adopt durable and high thread-count material, which can be used for a long time. It is must-have accessory for any successful men, Suitable for most occasions: dinners, birthdays, weddings, parties, events, and special occasions. Bow size(length x width): 4.3 x 2.7 inches(11.0 x 6.8 cm); For neck size(Adjustable): 13-19 inches(32-43 cm); Total length: 39.4 inch(100 cm); Handkerchief size: 10 x 10 inches(25 x 25 cm); Crafts: jacquard woven bow tie; Package include: bow tie & handkerchief. Innovative design, classy color combination, many of our customers received a lot of complements. Handmade craft make supreme quality. For more high quality bow tie with unbeatable price, please click our brand name"HISDERN". Here are more than 500 styles for your choice. Every item is checked carefully before it is shipped to you. Should you still not like the bow tie, then simply return it back to us and we will refund your credit card. After all, we want you to be happy with your purchase. If you have any questions about this product by HISDERN, contact us by completing and submitting the form below. If you are looking for a specif part number, please include it with your message.